1934 Nepal Bihar earthquake was one of the worst earthquakes in Nepal and India. Munger, Kathmandu and Muzaffarpur were completely destroyed. This 8.2 magnitude earthquake occurred on 15 January 1934 at around 2:13 PM. 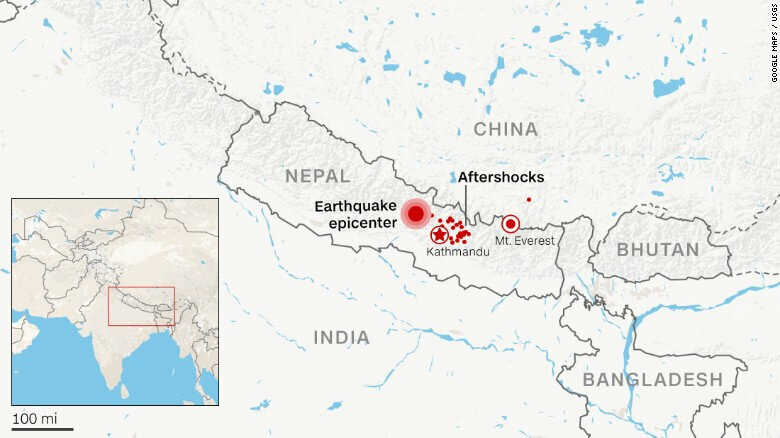 1934 Nepal Bihar Earthquake, the epicentre for this event was located in eastern Nepal about 10 km south of Mount Everest. The areas where the most damage to life and property occurred extended from Purnea in the east to Champaran in the west—a distance of nearly 320 km (200 mi)—and from Kathmandu in the north to Munger in the south—a distance of nearly 465 km (289 mi). The total number of deaths recorded in Bihar was 7253, and other deaths in Nepal totalled 10,800 to 12,000. Click to enlarge image of "Nepal Kathmandu Earthquake 2015 Map"